Waterloo, Iowa RiverLoop Public Market reuse strategy and marketing | Vandewalle & Associates, Inc.
Vandewalle & Associates was retained by the City of Waterloo to help with a vision, redevelopment, economic positioning and marketing of the downtown’s riverfront and adjacent properties. The vision was for newly revitalized, connected public spaces including a central RiverLoop Expo grounds and an adjacent Public Market. 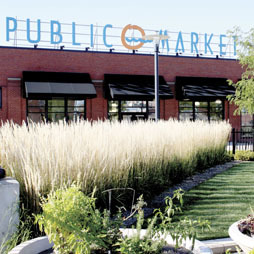 The schematic for the Public Market reused an existing building just off the new expo grounds, outfitting the new Market with its own commercial kitchen equipment and meat locker. Vandewalle & Associates took a leading role with the local food concept development and architectural design for adaptive reuse of the building, and initially assisted with an array of marketing materials to help with the concept launch. After five years, the volunteer-based enterprise left and the City began looking for a new tenant to enliven the space. As testament to the new momentum in Downtown Waterloo, Waterloo City Council members in 2018 had three competitive proposals to choose from to utilize the downtown Public Market building, including two breweries and a bike shop. Ultimately the Council voted to approve a seven-year lease with Verve Kombucha to operate a bistro and brewery to operate out of the high-profile structure.